Copper Canyon Press, 9781556594816, 80pp. 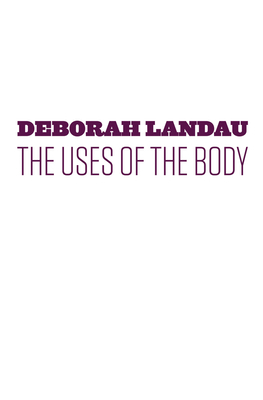 Deborah Landau's Uses of the Body presents the very specific challenges of womanhood. Her poems address what it means to be alive--right now--in a female body. She fills her poetry with compelling nouns: wine glasses, bridal gowns, and "books and teacups and ghosts." And what ghosts: underneath evocative images and poetic play, there's a moving, yearning mysticism. The uses of the body. Rinse repeat. The major and minor passions. Sunlight. Hair. The basic pleasures. Tomatoes, Keats, meeting a smart man for a drink. Its red and white trim. so you won't really see me. Deborah Landau is the author of two books of poetry. She was educated at Stanford, Columbia, and Brown, where she earned her PhD. Currently she is the director of the NYU Creative Writing Program and lives in New York City. Deborah Landau is the author of Orchidelirium, which won the Anhinga Prize for Poetry, and The Last Usable Hour (Copper Canyon Press, 2011). She was educated at Stanford, Columbia, and Brown, where she was a Javits Fellow and received a Ph.D. in English and American Literature. For many years she co-hosted the Open Book series on Slate.com, and she is the Director of the NYU Creative Writing Program. She lives in New York City.